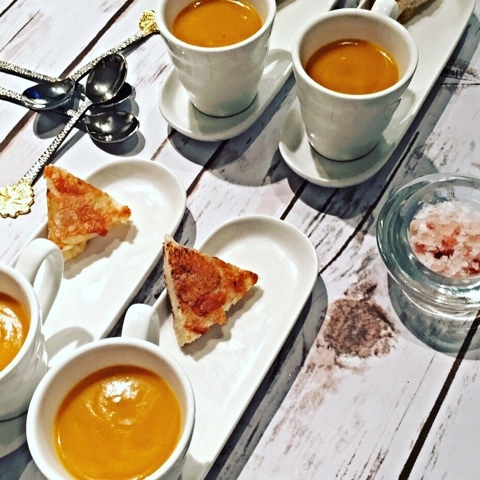 Butternut squash soup with a hint of rosemary, served in espresso cups served with tiny cheese toasties, or serve in mugs with a side plate piled high with toasties for a NYE treat when the fireworks are being let off. Roast the butternut squash, potato, onion and rosemary in a little olive oil for about 25-30 minutes, until all the veg is soft, set to one side to cool. Butter the bread on both sides. Cover 2 slices of bread with the grated cheese and place the remaining slices on top of each so you have 2 whole sandwiches. Remove the crusts and cut each sandwich into 8 triangles. Place the 16 mini sandwiches onto a lined baking sheet, cover with parchment and place another tray over it, chill for at least 30 minutes, up to 24 hours. Place the roasted vegetables (removing the woody stem of the rosemary) and stock, into a food processor, blitz until smooth. Chill until required, up to 48 hours. To serve, remove the top baking tray and toast the sandwiches in a preheated oven at 200˚c for about 8 minutes until golden. Pour the soup into a pan season, then heat over a medium heat until hot, swirl with the cream. Pour into cups, season to taste and add one or two cheese toasties on the side. *The soup can be frozen in a tupperware container for up to two months.